// and set the image uv wrap to "repeat"
Changing setimagewrap options there is not changes on the image. Is a bug of setimagewrap? looks like just a bad example to show on phone as the created images are not power of 2 so you can't use the wrap functions (should work fine on PC though). I dont see a problem with the example code and it works fine on 2 of my pc's. Without turning on the wrapping you get a clamped image with only 1 circle where as turning it on gives you multiple circles as expected. It creates images 64 x 64 pixels which ARE a power of 2.
there isn't strictly anything wrong with the code it just doesn't create 64x64 images on some phones because the GetImage command isn't an exact size - it even states it in the help file. Quote: "Note that the image produced by GetImage() is not guaranteed to have the same width and height as those given to the command, this is because the image is created from a portion of the screen which has a different size on different devices"
Of course, Its grabbing a proportion of the virtual resolution so wont map necessarily 1 "virtual pixel" width to one "actual pixel" in the backbuffer. Only if the virtual width and height is the same as the actual device width and height will you get what you ask for. I get what you meant. 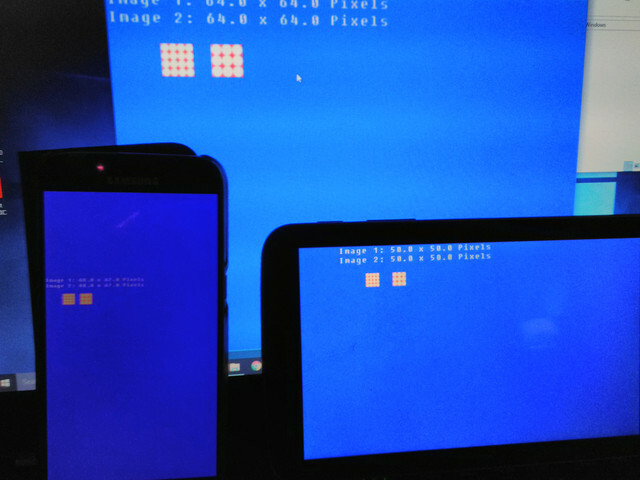 What I was trying to say is that doesnt always matter though as the image will still wrap on many devices with none power of 2 pixels by by using the default commands. On my phone the image is 67x67..on tablet its 50x50 and the wrapping functions still work ok.
yes, the help code its a bad example. Now i understand the command so. thanks! !